Where will you choose to listen to audiobooks or purchase audio books? As world's biggest online digital producer for downloadable audiobooks, Audible could be the first option to buy audiobooks for listening. However, the price is a little expensive of purchasing an audiobook from Audible, $25 to buy an Audible book separately or $14.95 with Audible membership. If you are a die-hard audiobook fan, no matter which way to select to buy Audible books, it will cost you a lot of money. Will you turn up to some free audiobook sites like Overdrive? Unfortunately, some unique audio books are only available in Audible online digital store. You might wonder to know whether there is a possible way to listen to Audible audiobooks without a membership. The good news is Amazon offers a wide variety of discounts for users. Here, we will introduce three solutions for you to buy Audible audiobooks without having to pay for an extra subscription fee. When you navigate to Audible official website, you will see the promotion slogan saying 'Try it free for 30 days and get a free audiobook'. Yes, if you are the newbie who has never subscribed Audible membership, it's the best chance to get free Audible audiobooks by singing up to this 30-day free trial plan on Audible with no cost. Step 1. Open your favorite web browser from your computer desktop and enter to Audible website. Step 2. It will require you to sing in with your Amazon account. If you don't have, please create a new Amazon account under the New to Amazon menu. Step 3. After logged in, you can start to select two audiobooks from more than 150,000 titles including best sellers, new releases and so on. Step 4. Once found out, please add them to shopping cart and choose '30-day Trial Membership' plan to fill in with your payment info. Step 5. After that, you will get the free books on your cart and you can start to download free Audible books on your computer and listen to them on Audible authorized devices. Notes: Please don't worry that Audible books will disappear when the date is expired as you can keep the audiobooks permanently even without Audible membership anymore. Whispersync deal is suitable for audiobook lovers who also are e-book readers. Whispersync is a service enables readers to synchronize reading progress, bookmarks, and other information across Kindle devices and others. One of its perks of this service is that if you purchase e-book and its related audiobooks from Whispersync page, the amount you will cost will be chapter than purchasing one version only. If you don't purchase the target audiobook or eBook, please directly enter to Amazon Matchmaker page, this service will detect the audio version counterparts of the eBooks, and then you can buy them together with lower price. If you have already purchased audiobooks, you need to navigate to Audible library page to discover the eBook counterpart and purchase it instead. To thanks to its loyal customer, Audible always launch lots of promotion activity untimely. 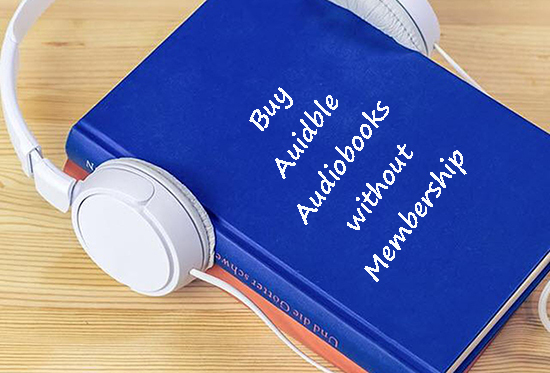 It offers some special daily deals for users to purchase audiobooks with a lower price than paying with Audible membership subscription. 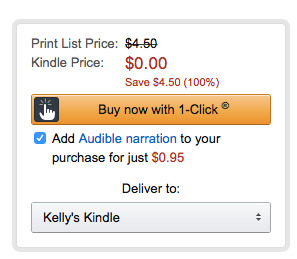 To use this way, you need to pay attention to Audible's daily promotion to see which audiobook is under the hot sale. Alternatively, you can subscribe to it by email to avoid missing the offer of your favorite audio books. Step 1. Navigate to Audible Daily Deal page and then you can start to check which audio book is on the big promotion. Step 2. Once you have found out the audiobook that you'd like to listen, please hit on the 'Buy' button to purchase it. Step 3. And then you will need to input your payment info to finish the order process and you can save a big without an Audible membership. There are three ways offering you to listen to Audible books with lower price even if you don't have Audible membership. But no matter which way you choose to buy Audible books without a membership, you can only be able to play downloaded Audible audiobooks on selected devices due to the DRM technology promotion. To make the way of listening to audiobooks more enjoyable, here, we will also share the powerful way to play audiobooks from Audible on any device as you like. 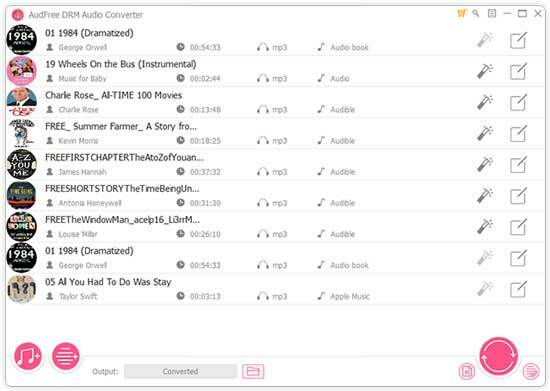 You just need to use AudFree Audible Converter for Mac/Windows to remove DRM from Audible books and convert them to common audio files, like MP3 and then you can transfer them to all platforms as you like. Step 1. You can click the '+' button to select Audible books from iTunes library to AudFree. Or you can drag and drop Audible books from your computer the AudFree's main interface. Step 2. To make Audible books playable on other devices, the recommended step is to set output audio format as MP3 by clicking the 'audio' icon as MP3 files can be recognized by all devices. Step 3. After all settings are OK, please simply click the 'Convert' button at the bottom-right corner of the main window and added Audible files can be saved as MP3 files on your computer automatically. You can use the above ways to buy Audible books without a membership and then use AudFree Audible Audiobook Converter to convert protected audiobooks to MP3. After that, you can play Audible audio books without restriction. Top 10 Best-selling iTunes Audiobooks How to Gift An Audible Books to Others Play Audible on Fitbit Versa/Ionic? Solved!